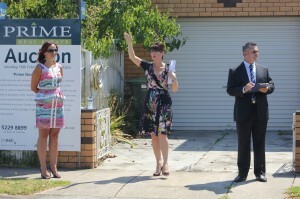 Prime Results at Newtown Auction! Prime Real Estate successfully auctioned the property at 32 Russell St Newtown, one of Geelong’s premier suburbs, last weekend. A number of eager interested parties and onlookers attended to see Gina and the team conduct the Auction. The generous site, set on approximately 1,300 square metres of prime real estate, allows for numerous possibilities including redevelopment or subdivision. The property was sold immediately after the Auction at an undisclosed price. Contact Prime today if you would like a free no-obligation appraisal of your property.